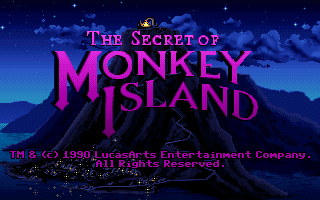 I'll be playing the 'Monkey Island Madness' CD version of the game today, but the first time I ever saw the game it was running on an Amiga and a screen appeared at the start that looked a lot like this one. 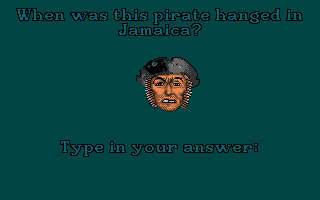 I knew absolutely nothing about Monkey Island at that point, it was just another set of disks in the pile I was borrowing from my uncle, but I figured that a game spanning four floppy disks was likely going to be more than a history quiz about dead pirates. My young underdeveloped brain made the leap that this could be foreshadowing, showing a character who was going to by hanged by the end of the story. Of course it just turned out to be the Dial-A-Pirate DRM, entirely unrelated to the story or anyone in it. But that feeling that the game was going to end with the death of a pirate stuck with me somehow. So when the hero of the game came up on screen and announced he wanted to be a pirate, I put 2 and 2 together in my head and ended up with 22. The cheerful music, the comedy routine he's going through and the fact he's called Guybrush Threepwood kinda clued me in that the the game would be leaning towards humour, but I was still worried things would go a bit 'Monty Python's Life of Brian' for our protagonist in the final act. I'm not going to spoil if I was right or not, but I will say that these days I worry sometimes that a story's going to go a bit 'Monkey Island 2'. 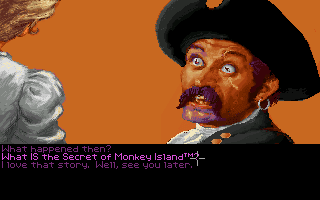 Anyway, the game starts with a non-interactive conversation between Guybrush and an optically-challenged lookout, with the young pirate wannabe expressing that he wants to be a pirate. The lookout points him in the direction of the Scumm Bar and tells him to go chat to the pirate leaders. Constructed from a few screenshots stitched together. I've found the Scumm Bar! The place is kind of hard to miss really, plus it's the only thing I can interact with aside from a 'Re-elect Governor Marley' poster. I don't have to go inside just yet though; I could go back over to the left, up the cliff, past the lookout, and go wandering across the island. Or I could continue right and head into town. But that'd be dumb so I won't. I may already know what I'm doing, but Guybrush doesn't. It's weird how this area is almost entirely silent except for the sound of waves, seagulls and creaking wood. There's nothing funny about a quiet walk in the moonlight but that's how the game starts. Ah, there's the music! Here have another YouTube link, see how long it takes you to get tired of it continually looping. Now there's actually something here for me to do, I can talk about my HUD down there at the bottom of the screen. Some players hate the way it eats up over a quarter of the screen space, but the way I see it I'm getting 1.85:1 widescreen in a game from 1990! The game kind of gives the impression that I'll have to keep taking my mouse down into the box of verbs each time I want to do anything, but it's actually more user friendly than that. Clicking somewhere with the left mouse button sends me walking there and clicking something with the right does the most sensible action (usually 'look at', 'talk to' or 'open'). Plus there's keyboard shortcuts, if you're into that. Right now I'm supposed to be looking for pirate leaders, so I'm going to start right clicking on pirates. Pirate #1 doesn't know the Secret of Monkey Island™ but he's got a few answers for me. Turns out that that the bar is so packed because the pirates in the area are too terrified to set sail. There's a ghost pirate called LeChuck terrorising the seas between here and Monkey Island™, and the guy was scary enough even before he died. I'm playing the CD release, but it's not a 'talkie' version so I don't get any voices here, just CD quality music. In fact it took LucasArts 20 years to finally give the game a fully voiced special edition, starring the main cast from Curse of Monkey Island. I love how the minor characters in the bar get proper painted portraits though; that's something you don't see all that often in 2D adventure games. They've even get a few expressions to switch between, though their mouths are firmly shut for the whole conversation. The little pixel characters do have animated lips though weirdly, and the screen-filling portraits are quickly phased out in favour of them as the game goes on. This pirate's being less helpful, but the Loom game he's talking about sounds pretty good. Hang on, I actually finished Loom and I don't remember any high resolution 3D landscapes in it! I don't remember anything from it in fact. Though I do know that this character is actually a henchman from the game making a cameo appearance to do a bit of subtle in-game product promotion. SOON, IN THE NEXT ROOM. Alright, I've found the pirate leaders drinking in the back room, and now the chapter title is making a lot more sense. They weren't exactly impressed with me when I stepped in past the curtain and chose to boldly exclaim "I want to be a fireman", but I'm not impressed by how they don't get portraits so I guess that makes us even. Guybrush isn't exactly overflowing with pirate swagger, but they're low on help due to the LeChuck situation and he assures them that he has the special skill of being able to hold his breath for 10 minutes, so they're willing him to give him a chance to prove himself. He must master the sword and defeat the Sword Master of Mêlée Island™. He must master the art of thievery and steal the Idol of Many Hands from Governor Marley's mansion on Mêlée Island™. He must find and dig up the Legendary Lost Treasure of Mêlée Island™. I'm on Mêlée Island right now by the way, just to make that clear, and I swear to you now that I'll maybe get at least one of these trials done before I turn the game off. First step: getting inside that kitchen under the skull on the right. Alright I've successfully stolen the half-eaten fish from a seagull by kicking the plank! You never know when you're going to need a red herring. I already grabbed a hunk of meat and a head-sized pot from the kitchen so this completes the hat-trick. Sadly Guybrush refuses to take the picture of the Pillsbury Doughboy. This wasn't the first puzzle though. First I had to figure out a way to get inside the kitchen without the chef noticing me. Turns out the trick is just to wait until he's gone. Definitely getting a bit of a 'hell' vibe from this place. The screaming faces embedded in the rock is a nice touch. It's LeChuck himself, in the flesh! Well he's there in spirit anyway. I've been playing happily without voice acting so far, but Earl Boen nailed the role of LeChuck in the later games and I'm definitely missing his presence here now. His theme tune's definitely present though and it's one of the best tracks in the game: YouTube link. 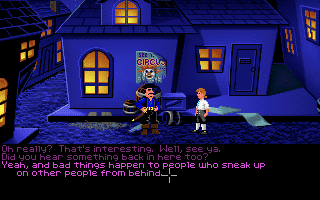 What you're witnessing here is one of LeChuck's unfortunate lieutenants informing him that a new pirate wannabe is in town and he's not entirely spineless like the rest of the pirates cowering in the Scumm Bar. He also points out that he's basically the opposite of a threat, but LeChuck's savvy enough not to leave a wild card in play, so he announces he'll be heading to Mêlée Island™ to take care of him personally. So I guess I'd better get started on that basic sword training then. First though I need to raise money to buy a sword (and a treasure map, spade, pack of breath mints and anything else I can avoid having to swipe from innocent pirate townsfolk). These three are trying to sell copies of the minutes of the last meeting of the Mêlée Island™ PTA which I'm not entirely sure I need. In fact no one needs or wants them so they can't even give them away. I offered to take one anyway if they'd give me two pieces of eight and they agreed, so I've got a little cash now at least. Only need 98 more to buy a map. Most of the other doors in this street just eject me back out somewhere else down the road, but there is someone important I need to visit... the Voodoo Lady! To be honest I'm just dropping in on her to steal this rubber chicken with a pulley in the middle and then I'll be leaving. I don't think you really need to speak to the Voodoo Lady at all in this first game, but it's plausible that I'm entirely wrong. All I know is that I've got a vivid memory of being confused when she started talking about all the help she'd already given me when I met her in Monkey Island 2. Hey, this seems like a great opportunity for me to start comparing all the other ports of the game, starting with the 16 colour EGA version! Actually I just wanted an excuse to show off this weird Indiana Jones joke that only shows up in a demo (possibly because there's a demo of Indiana Jones and the Last Crusade on the same disk). I really am tempted to show off a half-dozen different screenshots of the same room on different computers, but there really isn't much point as the ports all have basically the same art and resolution, with just the colour depth and interface changing. The DOS EGA and Atari ST versions have 16 colours, the Amiga and Mega CD versions have 32 colours, and the DOS VGA and FMTowns versions have 256 colours. When it comes to the interface, the ones on floppy disk have 12 verbs and a text inventory, the ones on CD have only 9 verbs and show pictures of your items (and they all have the same CD music). So unless you're really into the Amiga version's soundtrack (and you should be), the 256 colour VGA PC CD version I'm playing right now likely the version to go for. Fortunately it's exactly what you get when you switch to retro mode in the Special Edition remake. 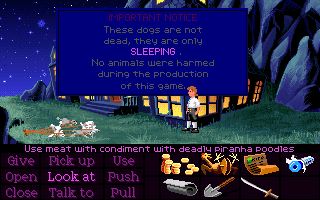 Hey wake up, I still haven't told you where Secret of Monkey Island fits in the LucasArts adventure game chronology! Fine I'll get back to playing the game then. I went through the arch into the second section of town, and immediately got waylaid by Sheriff Fester Shinetop who had a couple of threats he wanted to share with me. Nice guy. He soon left me alone though. Just me and a clown poster in a creepy alleyway at night, admiring the dithering on the walls. I examined the poster just to be thorough and apparently Guybrush loves the circus! I'm going to have to remember to do something to fix that. I've found a shop next to the alley selling both swords and shovels! Shame that I'm entirely broke. Actually I do have those two pieces of eight for taking the PTA minutes so I can get breath mints at least. The cranky old shopkeeper claims he's the only person who knows where the Sword Master lives and he's suspiciously willing to hike across the island to ask her if it's okay if he shows me the route. Seems like a good way to get him out the way so I can swipe a sword... except I already know he'll catch me, so I won't bother. 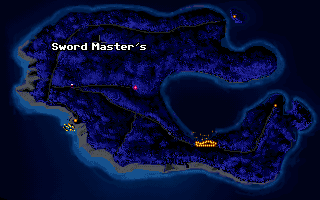 But I also know I can just follow him the whole way through the forest maze to the Sword Master's house, which is good because I'm not sure that it'd even occur to me to try that these days. Not many adventure games I can think of have you following a character around. While I'm out here I should grab some yellow forest flowers too. I've been waiting for someone in game to mention them and what they do, seeing as they'll be important later, but nope. Looking at them doesn't help either, Guybrush just mentions that they're yellow, but maybe when they're in my inventory I'll be able to get someone on this island to chat about them. Of course I can't go for a stroll through the forest maze without checking out the infamous stump joke along the way, where Guybrush tries to pull a Mario but is denied when the player finds they don't have the required disks. Anyway, you might think that it's obvious why they'd take out an 'insert floppy disk' joke for the CD version, but that's not necessarily the main reason it's gone. LucasArts apparently got lots of people phoning up and asking about the missing disks and they removed the joke from later releases to save themselves from future misunderstandings. 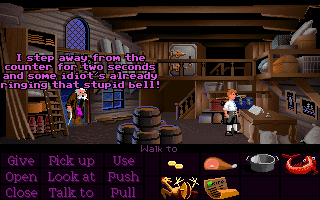 In fact in Monkey Island 2 Guybrush can phone up the LucasArts hint line and complain about it himself. 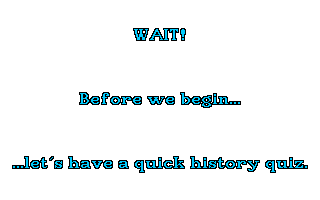 And in Curse of Monkey Island you can come back to this screen from the other side of the hole (only to be stopped by a terrifying horde of stunningly-rendered rabid jaguars standing just off camera). Though come on, who'd see this and honestly believe their copy of the game could be missing another 110 floppy disks? Well, except for Amiga owners. Turns out the miserable shopkeeper really was going to visit the Sword Master for me! In fact he takes any excuse to visit her because he's a crusty old letch. There's not much point me confronting her now though, as I haven't even got the bare minimum of sword training or cutting wit (or a sword), but this will mark her location on my island map for later. 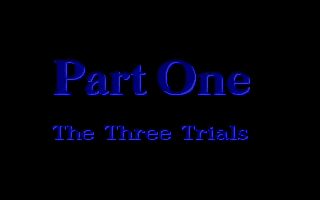 I've pretty much got the run of the entire island from the beginning (once I've dealt with George Lucas anyway), so there's a few directions I can start attacking my three trials from. Sadly I already know how to solve everything on Mêlée Island™ and I know that the best place for me right now... is the circus. A BRIEF WALK AND A SHORT CHAT LATER. By using the pot from the kitchen as a helmet and assisting these two with their cannon calibration Guybrush has earned the cash to buy the sword he needs for the sword fighting trial, plus the spade and map he needs for the treasure hunting trial! Hopefully it's also taught him an important lesson about circuses. You know, it's never occurred until now how weird it is to play an adventure game where you can do a job to earn money and then just buy the things you'd logically shop for in real life. Okay I played Dark Seed earlier in the year and that has a shop too, but there's nothing logical about that game. You have to buy a certain item with your limited money to make a man appear and give you a 'Get Out of Jail Free' card, but you don't know which item and you don't know that you can make him appear and... man Dark Seed is a bad game. Monkey Island on the other hand makes perfect sense so far, aside from those damn yellow flowers. While I'm back in town to do some shopping I figured I'd drop by the cells and give the prisoner a breath mint to help make him a bit more bearable to talk to. It turns out he's in here because he's been accused of picking the yellow Caniche Endormi flowers in the forest and still no one's telling me what the deal is with them. Man if Sheriff Shinetop's willing to lock a man up for picking flowers I hate to see what he'll do when someone commits a real crime around here. And by 'someone', I mean 'me'. And by 'around here' I mean 'I'm going to rob the idol from the Governor's Mansion'. LATER, OUTSIDE THE GOVERNOR'S MANSION. Yellow flowers + hunk of meat + vicious guard dogs = sleepy poodles. You see, the yellow flowers actually contain a sedative, but as far as I can tell there's nothing in game that explains this. Sure the pirate leaders outright say I should drug the dogs, but the only clue in there that the flowers are the drug I'm aware of is the fact that picking them is illegal. Well aside from the fact that 'caniche endormi' means something like 'poodle asleep' in French. Anyway now that the guards are dealt with I can go complete the thievery trial by nicking the Idol of Many Hands from Governor's Marley's mansion. There's a whole lot of puzzles that need to be solved for this section, but they happen behind that wall so Guybrush has to figure them out without me. The only clues I get to what he's up to in there are the messages above the inventory and a variety of thuds and smacks. He seems to know what he's doing though, he's a smart kid. Smart and ridiculously brave. SOME ACTUAL PUZZLE SOLVING LATER. I'd totally forgotten how Guybrush spends half the game getting dropped on his head. The guy's tougher than he looks. Surprisingly well animated too! Governor Marley herself catches Guybrush on his way out! But she's got no intention of having Sheriff Shinetop arrest him. He's a dashing young pirate with the skills to steal the idols and she's been curious about him ever since she heard his... fascinating name. She seems a little irritated by the way he's a gibbering idiot though. MEANWHILE, IN THE 2009 SPECIAL EDITION. 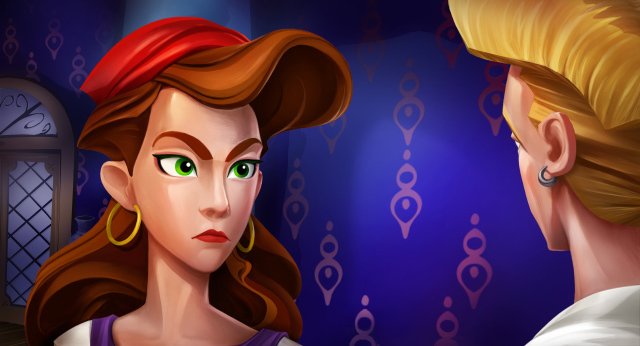 For whatever reason they decided to go with a more cartoony art style for the remake and I think that's a shame as I've always liked the painted look of Monkey Island. I mean this isn't a terrible look for Elaine, but I'm finding it hard to compare it to the screenshot above and call it an improvement. Also weren't her eyes purple? Speaking of shifting eye colours, here's some of Guybrush's various looks over the years in his various games. My Guybrush will always be the guy in the first three squares along the top left, but I'm sure everyone's got their own favourite. 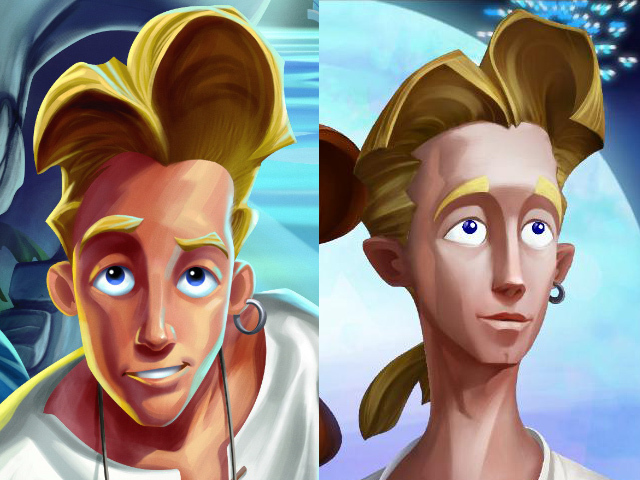 I know it’s not exactly breaking news that Special Edition Guybrush has hair like Rayman, but I'm still amazed he went from concept art to finished game looking like that without anyone caring that his hair is an elaborate wood carving. He's even got a 'Dreamworks face' going on in that picture on the left, it's horrible. ...oh, well that isn't good. Turns out that Sheriff Shinetop feels a lot more strongly about stealing than Governor Marley, but isn't too bothered about returning the stolen property. He even stole my sword! So here I am stuck underwater, surrounded by sharp things I can't reach. 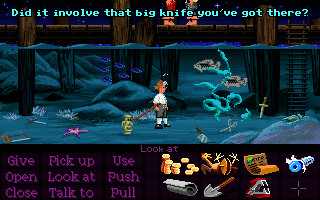 The thing about LucasArts adventure games though is that there's no way to get hopelessly stuck or killed in them, so Guybrush can hold his breath for more than long enough to solve this problem. But if you somehow don't solve it after a couple of minutes, a couple of pirates eventually arrive and start discussing a felony one of them just committed and what he should do with the big sharp knife involved. It doesn't help Guybrush in any way, as the pirate decides to keep his blade in the end, I just thought it was cool they threw this in even though most players won't ever see it. Wait out the full ten minutes and Guybrush is dead. Turns out that it actually is possible to die in a LucasArts game! Though really you'd have to deliberately wait out the timer to see this happen, as solving the puzzle is actually ridiculously simple. I'm not going to spoil it though! I've already ruined enough of this game for people who haven't played it yet. I got the idol and that totally counts as completing a trial, so I'm done here. The Secret of Monkey Island... takes way longer to get around in than I remember. I mean the walking speed is fine, but you have to cross so many screens to get anywhere that I got worn out just watching Guybrush get from the town to the island map and back. Over and over again. But it's probably still a really good game! I can't honestly tell at this point though, as I've played through Mêlée Island™ a thousand times and I know all the puzzles and jokes. I've been enjoying it just fine as an interactive story though, so far anyway. 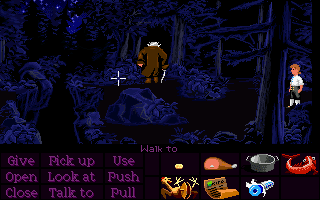 I recall it going a bit downhill in the second half as you wander the sunny jungles of Monkey Island itself, but maybe I just hate walking around trees in adventure games. There's never any good puzzles or interesting dialogue around trees, just pixel hunting and... uh... wow it seems like I've forgotten what you actually need to do in the second half entirely. Probably a reason for that. It's definitely not crap so it can have one of my shiny Gold Stars. I mean I'd put this back on just to listen to the music, so the wit and story is just a nice bonus for me. There you go, the first and only article on the internet about Monkey Island which doesn't mention that Guybrush's name comes from the Guy.brush file his sprite was saved to in Deluxe Paint. I also didn't mention insult swordfighting, the Sam & Max statues at the Giant Monkey Head, the rubber tree Sierra adventure death fakeout or the multiple endings! Of course we already knew about the game, but it's good to see the old place again. Drop the puzzles from a Lucas or Sierra adventure and they still have the charm. It's all the neat places to go to and all the little details to find. It's all the people to talk to and all the things you get to do with an inventory and more verbs than Shoot and E. They should package these things with postcards. And in a few decades, I'll have forgotten enough to tackle the puzzles. Ye gods, I adore this game. I first played it on my mate Stephen's 386 and then later got it on the Amiga and fell in love with it all over again, with actual music! I know that officially the sequel is better but I won't be convinced; the original game is in my top ten games of all time. Here, have some funky LeChuck. I fully endorse that link. Oh gosh. Red herring. RED HERRING. So it was a joke!!! After twentyfive years, I discovered another joke hidden in the original Monkey Island! Back then I was playing the game in Italian, and we don't have a saying such as "red herring" here, so the joke didn't translate as far as I remember. Anyway, I loved how the original Monkey Island featured photorealistic illustrations of the characters. I thought it worked much better that way. When you see wacky cartoony drawings, you're already expecting jokes and funny moments; but when you see photorealistic images you don't and, somehow, it makes everything work much better here. Too bad it switched to the toony style soon enough! Ooh! Ooh! Did you play Quest for Glory 2? Did they have that joke where people measure distances in skareen lengths? I think this game is overrated. I first heard of it in PC Gamer in 1997 but didn't play it until this year. I liked adventure games when I was younger but they just don't appeal to me. I am still going to finish this on DOS, followed by Gabriel Knight SOTF, Darkseed 1 & 2 and Sam and Max, but realistically this game while clever, funny and atmospheric/moody is overrated and overhyped. If you think Monkey Island is bad, man you're going to be disappointed by the Darkseeds. I'm staggered anyone would think of this as over-rated (comment above). I guess it's the old problem of coming back to it later in life after every other game has desecrated the corpse and not being able to see how truly spectacular it is. The Stylish Confetti scene is the best thing in any game, ever. Anyway, so glad someone else hates SE Guybrush. All the joy of an HD remaster, but they totally ruin the main character. I wish I could use old Guybrush/Marley but have everything else the new smooth graphics.